A strong marketing plan defines the strategy a company is using to reach its customers. It helps companies identify core objectives, define a clear roadmap and grow faster. 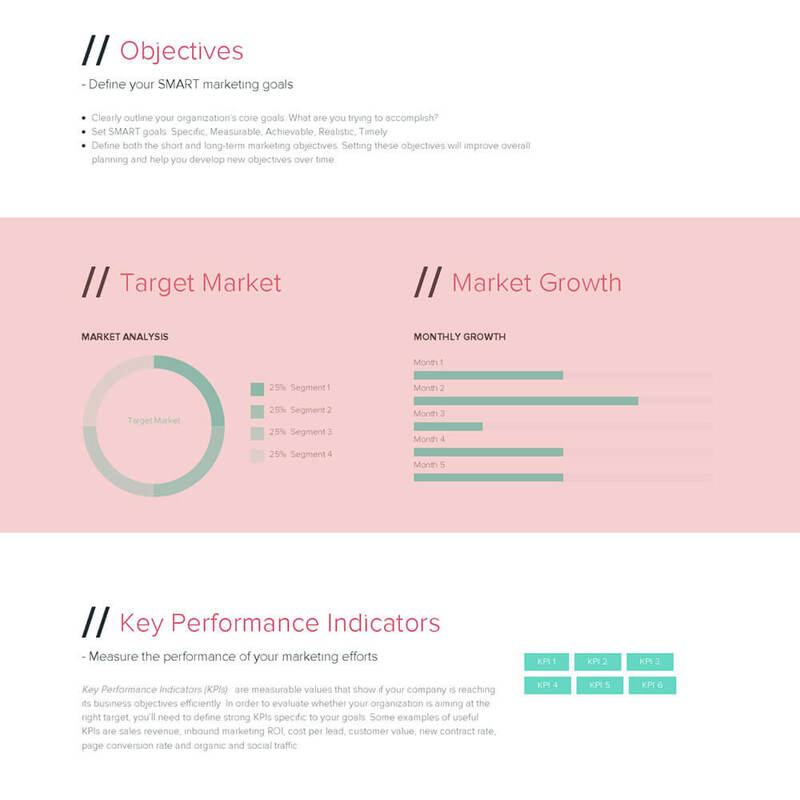 In order to align your product or service with the correct target audience, you’ll need to do your market research and carefully put together your marketing plan. Create your Marketing Plan - It's Free! Your starting point to create and share a beautiful marketing plan, without any design experience. It’s useful to give a brief summary, 2 or 3 sentences, at the beginning of your marketing plan. This gives an overview of your strategy and makes it easier for everyone to understand what the focus of your plan is from the onset. In most scenarios, your plan will evolve and change as you are developing it so it’s better, and certainly more practical, to summarize the plan at the very end when your team is aligned and the plan is finalized. A significant part of your marketing plan is the strategy you will follow. No matter how strong your product or service is, you will need to study your entry market in order to define how you will reach your target audience. This means that you will need to understand both the internal and external factors which impact your company’s overall success. You can take advantage of a SWOT analysis, create your buyer personas and fill out a competitive analysis to ensure that your strategy will help you to meet with your ideal customer. Know your value proposition. How does your product or service solve your audience’s need? It’s important to clearly understand what makes your product or service attractive to customers. While defining your value proposition, make sure to stay specific. Avoid comparing what others in the market are doing to achieve their goals, focus on what your technique will be. Why did you choose this strategy? Explain the key elements that led you to this strategy and the reasoning behind your decisions. Out of all possible methods, you came to a conclusion and defined a roadmap for your marketing efforts. If it is not mentioned distinctly why you made this decision, it will not be convincing and adaptable to new situations in the future. Simply, a marketing mix is having the right combination of product, time, place, and promotion. While it might not seem that complicated to make sure all 4Ps are falling in the right place when it comes to reality this is one of the most challenging steps. It requires not only knowing your product or service inside-out but also being acquainted with the market, including your competitors, where you can find your target buyer, what they’re willing to pay and how they’re convinced of a product’s value. Without objectives, a marketing plan would be meaningless. Setting realistic goals at the early stages of your marketing efforts (or even early stages of your actual business model) is not an easy task. Reconsider the overall goals of your organization. What do you really want to accomplish? Short-term vs. Long-term goals: Define these objectives separately will improve overall planning and help you develop new objectives over time. What is your target market, how and why did you choose this market? A well-defined target increases the strength of your marketing strategy and helps you stay on the right track. Including a recent market analysis will also help you understand what you’ll need to do before taking any actions in your marketing plan. Try to think about the main factors for choosing this market by looking at your objectives. These will lead you to the right target. Bonus: Knowing your target market also means identifying your potential competitors. Take advantage of Xtensio’s Free Competitive Analysis Template for a powerful, broad analysis of the competition. 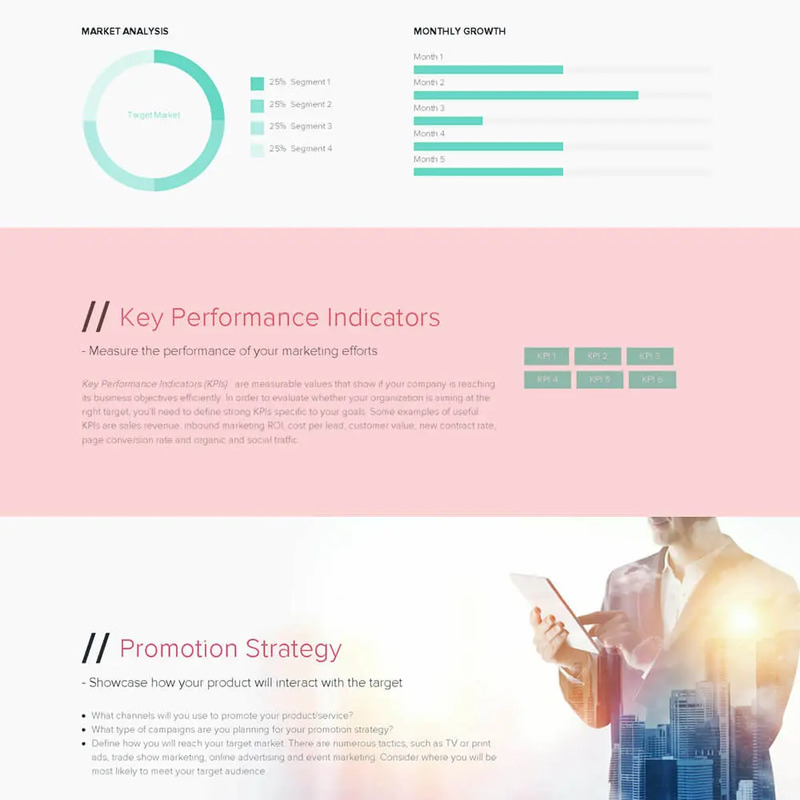 Key Performance Indicators (KPIs) are measurable values that show if your company is reaching its business objectives efficiently. In order to evaluate whether your organization is aiming at the right target, you will need to use strong KPIs specific to your goals. Organic and social media traffic. Your promotion strategy will showcase how your product or service will meet with the target buyer. Define how you will promote your product or service and indicate possible ideas for different campaigns. What channels will you use to promote your product/service? 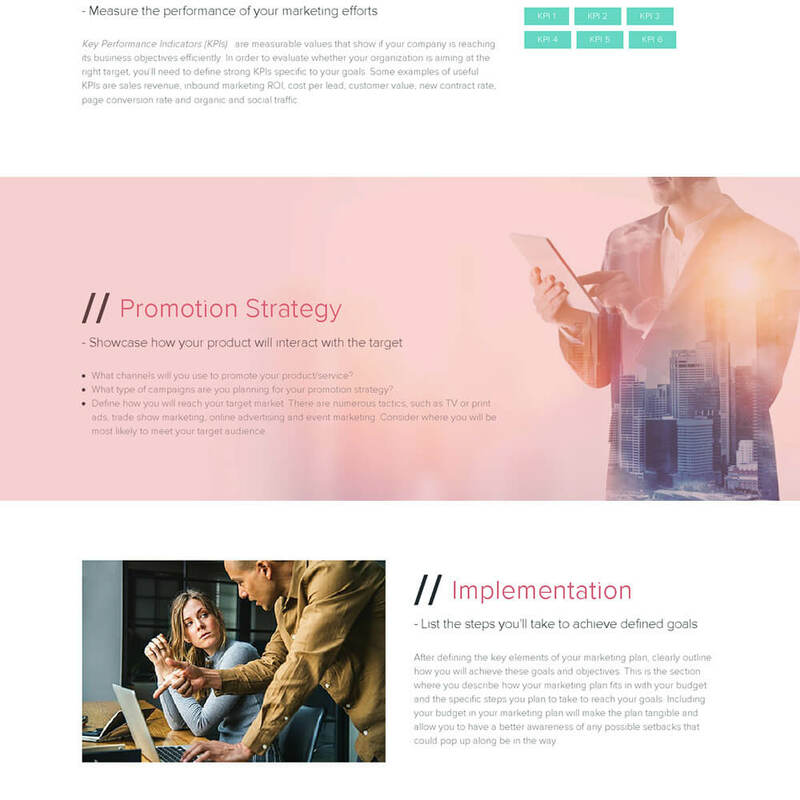 What type of campaigns are you planning for your promotion strategy? What is your budget to spend on the promotion? What is your customer’s behavior? Meaning which channels usually influence their purchasing decisions? Are they online shoppers? Are they active on social media? If you are putting all your efforts on Twitter but your target is an active YouTube user who doesn’t like Twitter, you’ll likely get nothing in return. Identifying the user behavior can take time and experience. If you aren’t confident in your understanding of your customers, save your budget and create a stronger marketing strategy when you know exactly who your buyer is and where they make their purchasing decisions. Company size can have a huge impact on your promotion method. Startups and companies with small marketing budgets are more likely to take advantage of email marketing and social media while companies with a higher budget tend to use TV ads, well-known newspapers or magazines, and services such Google AdWords for their promotion strategy. After defining the key elements of your marketing plan, clearly outline how you will achieve these goals and objectives. 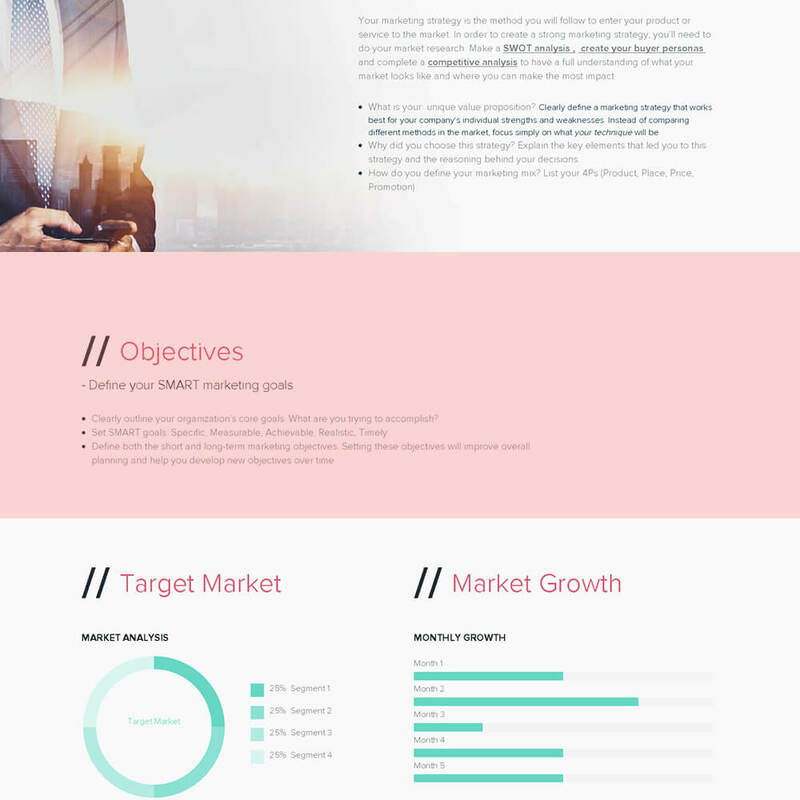 This is the section where you describe how your marketing plan fits in with your budget and the specific steps you plan to take to reach your goals. Including your budget in your marketing plan will make the plan tangible and allow you to have a better awareness of any possible setbacks that could pop up along be in the way. Marketers know that almost everything in marketing is dynamic: numbers, objectives, campaigns… This means that you will need to regularly update your marketing plan in order to follow the change in industry trends. 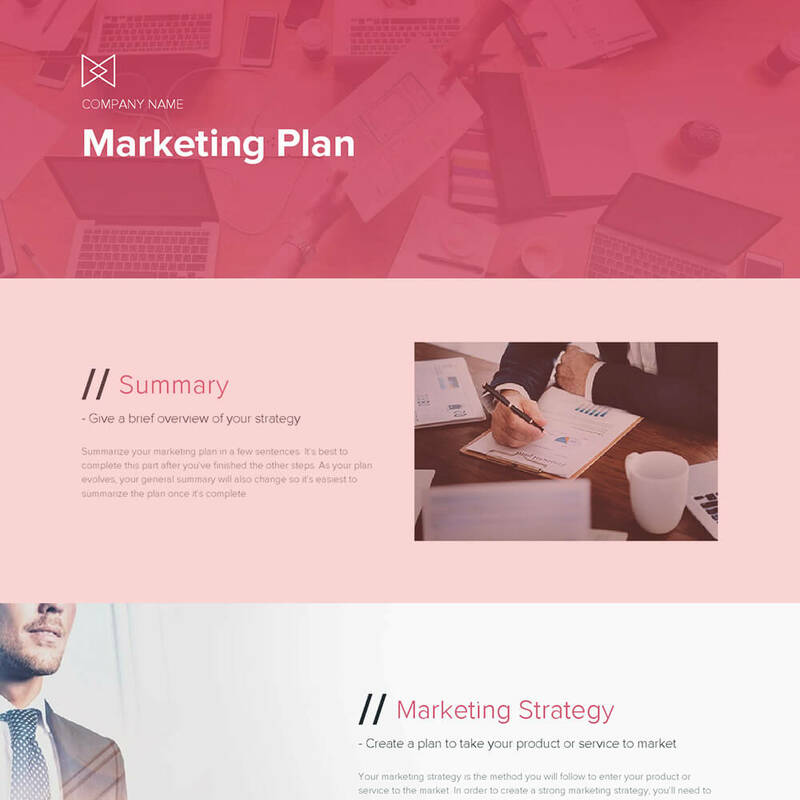 The marketing plan template is adaptable just like other Xtensio tools, it can and should be repurposed, revisited, and revised to suit your evolving needs. You can always add, delete, and move your modules and sections around with Xtensio’s versatile editor to adapt the marketing plan as you need it.